Windows must have the NFRC (National Fenestration Rating Council) label before they can be marketed as energy-efficient. 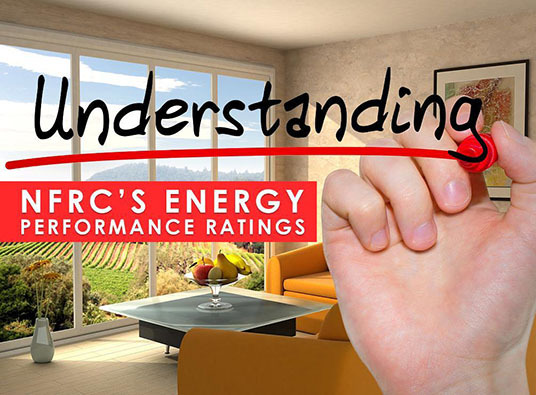 However, not all NFRC-certified products perform the same because each climate has its own energy efficiency requirements. This is why the most efficient units in Texas wouldn’t be as effective in lowering energy bills when installed in Maine. This fact would surely make you scratch your head in confusion when buying the right energy-efficient products. The U-Factor refers to insulation. It’s a measurement of how well the product keeps the heat in. Expressed in numbers 0.20 to 1.20, the lower the number, the better. Shorthand for Solar Heat Gain Coefficient, the SHGC refers to the ability of the unit to reflect the sun’s infrared rays. To minimize heat gain, choose replacement windows with low SHGC values. While the first two metrics pertain to invisible energy, the Visible Transmittance talks about the sunshine. It determines the amount of natural light that could come through the product. To get as much daylighting as you can, look for high numbers. Since most products are not completely weathertight, the NFRC quantifies the amount of air that could pass through the gaps around the units. Ranging from 0.1 to 0.3, windows with lower Air Leakage values are better at preventing unwanted drafts. This metric refers to the ability of the double-pane unit to prevent the exterior surface of its interior glass from fogging up. In indoor areas with high humidity levels, condensation formation might cause water damage, mold growth, and other phenomena that could make your home less livable. Expressed as a number between 1 and 100, the higher the digit, the better. At Kroll Construction, our replacement windows offer the ideal combination of NFRC ratings to make your home more comfortable in Detroit, Michigan. To learn more about our products, call us today at (888) 338-6340 to schedule your FREE, in-home consultation.